Ivy Bank015394 42601work Guest HouseWithin walking distance of viewpoints, tumbling waterfalls, Lake shore, shops and restaurants. Comfortable beds, spotless en suites, attractive décor, superb breakfasts, relaxed atmosphere. Aromatherapy available. Discounted use of local leisure club. 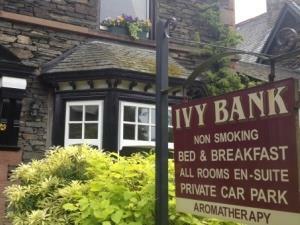 Ivy Bank is a pretty Victorian house built in the 1890's from local slate and retains many of its original features. We are situated on a quiet road away from main thoroughfares within a few minutes walk of the all the village facilities. All our bedrooms are en suite and are provided with a flat-screen TV/DVD player, radio/alarm clock, hairdryer, a selection of toiletries and hospitality tray. In addition, 2 of our larger rooms have a sofa. We have off-road parking and safe storage for bikes. Within 30 minutes' walk from Ivy Bank there are several excellent viewpoints, the lakeshore and tumbling waterfalls. Guests staying at Ivy Bank can use our membership of a local leisure club. This includes use of swimming pool, sauna, steam room, ice room and gym.